A GPS based website offering detailed route information for various sports such as mountain biking, road biking, walking, running, etc. 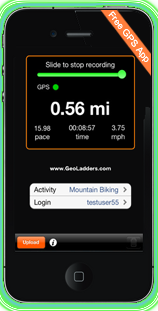 GeoLadders hosts 'free' weekly, monthly, and yearly amateur competitions based on a user's completed routes. Results are dynamically displayed as a ladder (competitors listed in order of their rank/points). Routes in Geoladders are assigned a point value based on distance, ascent and difficulty, every route ridden adjusts a riders ladder rank. It's motivating, healthy and good fun! Do I need a GPS to use this site? Ideally, but no, you can track your rides and get ranked on the ladder as long as you're riding routes that already exist on the site. If you want to create your own routes you will need a GPS. Other benefits to using a GPS include access to our Player (to Watch your movement on the map), Virtual Partner & The Game of Control. No, but it's recommended. Without an account you can still browse routes, maps, and photos. But, creating an account is free and provides access to all of the Geoladders site and feature set. How do I change my password or login name? Click on the dashboard tab (last tab across the top), then click on the 'Edit My Information' button on the right side (in your Basic Information block). Enter a new password at the top (and/or login name). How do I post a ride? If you have a GPS, plug it in to your computer (MAC or PC), click the 'Upload My Ride' button at the top of the 'Ladders' page, follow the steps. If you don't have a GPS, post your ride manually on the matching 'route page' (example) , on the left under 'Manage Rides' | 'Post Ride' option. Your posted ride then appears on the ladder page in the 'Completed Rides' section and on your Dashboard. Your weekly, monthly, and yearly ladder ranks are also adjusted. How do I create a route? 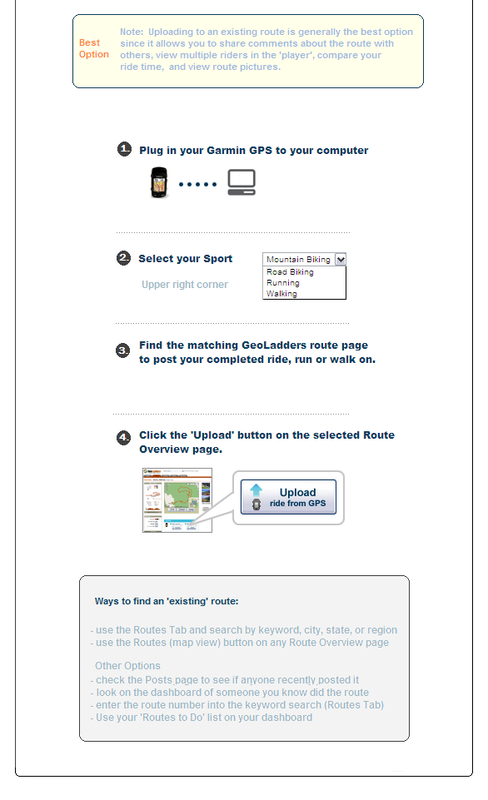 If you have a Garmin GPS click the 'Upload My Ride' button at the top of the 'Ladders' page, follow the steps. Or, if you don't have a Garmin GPS save your route as a .gpx using a third party application then upload the gpx file here (bottom left corner). Also see FAQ 12. What is the GPS Player? Using the Player you can watch yourself and/or others, 'move' on a GoogleMap (as a 'moving dot'). Player link exist throughout the site. Up to 6 riders can be played back at one time, great for comparing performance, seeing how long a break was, or how quick a flat tire got fixed. When a ride is uploaded it is immediately viewable in the Player (example). Can I display a GeoLadders route on my website? Currently you can link to any route. At some point it will be possible to display a route (map) and define it's size on your site. Can I upload and download routes using my MAC? Yes, our direct GPS uploads & downloads work on MAC and PC. Supported browsers include Apple Safari, Internet Explorer 6, 7, and Mozilla Firefox. What GPS units are supported? Garmin Edge 205, 305, 605 & 705, 200, 500 & 800, Garmin Forerunner 305, 405, Garmin 76cs, and others (both USB & serial are supported). What GPS do you recommend for this site? The Garmin Edge 305, 705, 200, 500 or 800 unit. We do not recommend the Edge 205 (it will work though) or other units without a barometric sensor since they offer less accurate elevation readings. Do you support GPS units other than Garmin? Yes, you can download any route from GeoLadders as a gpx file (click 'Download route to GPS' button (center of the page) on this sample route. Then on the next page notice the 'Download as GPX' link at the bottom left corner. Once downloaded to your computer, move the gpx file onto your GPS with the software your GPS came with, or other 3rd party sofware. Keep in mind, if you're using a Garmin 305, 705, 200, 500, or 800 you can avoid using GPX files entirely and plug your GPS into your computer using a standard USB cable, then upload and download directly with GeoLadders.com. Where does the route content come from? User uploads and our internal auto-creation tools. When a user uploads a GPS track to Geoladders, content such as Googlemap overlays, 3D graphs, gps Player, Garmin Course file, gpx file & route stats are automatically generated 'on-the-fly'. Anyone can create a route if they have a GPS, optional content such as geo-tagged pictures, route description and comments are added by the user. Some users go 'all out' and produce fantastically detailed routes, including slide-show walk-thrus, picture galleries and printed directions. How do I 'edit' or 'delete' one of my posted rides? Click the 'Dashboard' tab (last tab across the top). Scroll to the bottom, notice rides you've posted in gray. On the far right of any ride you'll see an 'edit' option allowing you to make changes to the ride or a 'delete' option to permenantly remove the ride from the system. Why is there a 'two ride per day' posting limit & '7 day window'? These rules help keep the ladder fair by not allowing new comers to post a large number of rides all at once (e.g. rides they might have done before they joined GeoLadders). If someone wanted to be destructive, it's quite teadious with a two ride per day limit. Premium members are allowed to upload unlimited posts since they're generally without exception looking for honest & fair competition. A pre-recorded activity (i.e. ride, run, hike) that you can compare your performance with (e.g. activities of others or yourself). Your progress is displayed on your Garmin GPS in feet or miles as your move (i.e. showing the distance ahead or behind in relation to your downloaded virtual partner). How do I download a Virtual Partner file to my GPS? Go to any route page (example), and click the 'Download' button below the map (example), click the 'Virtual Partner' tab). How do you fund Geoladders.com? How do I submit a feature request, ask questions, or provide other feedback? Please e-mail us at info@geoladders.com. Your comments and questions are welcome. How do I delete or change a posted ride? To delete a ride go to the 'dashboard' tab, scroll to the bottom of the page. Notice rides you've posted in gray. On the far right of each ride is a 'delete' option. Why don't I see my bonus points for passing someone on the ladder? If you click on the 'Icon Key' link at the upper right corner of the ladder you'll see the +10 bonus is for passing 5 users at once. You are awarded +5 points for passing a single user. But, the bonus doesn't apply till the end of the day, meaning if you pass someone, then later in the same day they post a ride and pass you, then there are no points awarded.